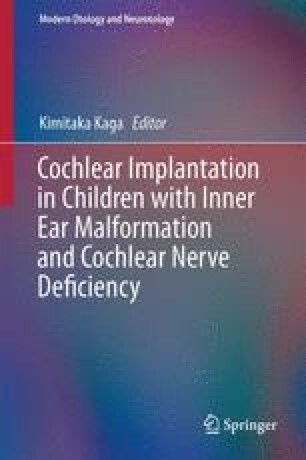 When cochlear implantation has been performed in a case involving inner ear malformations, it is particularly important to perform objective physiological measurements of the cochlear implant. The inner ear malformations can be divided into categories according to the observation of modiolus deficiency and/or cochlear nerve deficiency (CND). CND severity can be categorized in one of three ways, according to the MRI findings: (1) a hypoplastic cochlear nerve, (2) the absence of cochlear nerve, and (3) the absence of vestibulocochlear nerve. EABR is a reliable and effective way of objectively confirming device function and implant responsiveness of the peripheral auditory neurons up to the level of the brainstem in cases of inner ear malformation. EABR can often be recorded in cases in which the presence of excessive stimulus artifacts precludes the successful acquisition of ECAP, such as in cases with modiolus deficiency cochlea. This chapter presents cases with or without modiolus deficiency, depending on the severity of cochlear nerve deficiency, and describes their EABR characteristics. Vestibular simulated EABR is also shown, demonstrating the interactions between vestibular and auditory pathways.